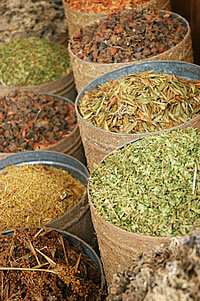 Like any fresh, high quality food, tea needs to be properly prepared to get the best out of it. When cooking good quality fresh food care needs to be taken - would you boil asparagus for thirty minutes or fry a fillet steak for an hour? The larger the amount of leaf, the stronger the infusion. The longer the infusion time the stronger the tea. Different teas require different temperature water: boiling water may scold delicate green and white teas. Small teapots are preferable because the strength of the infusion can easily be controlled. Large teapots both allow the flavour of the tea to dissipate and the leaves to stew. Pairing tea with food is an adventure in flavors. It is also a good way to get to know the variety in the world of tea. Tea provides an extensive range of tastes, similar to that of wine but without the associated alcohol. Tea has evolved for thousands of years along with regional cuisine to be the drink that goes along with meals. It is no surprise that it goes well with food. Like any small mid-course or a palate cleanser, tea is in one sense a great flavor bridge from one course to the next. More importantly it can also be paired with a specific dish - to help complete the flavor journey of that dish. The flavors of regional teas evolved with local cuisine just like wine evolved with its local cuisine. So a good way to think about natural pairings is to look at the cuisine from the tea regions. For instance, nothing could go with seafood better than Japanese Green teas - such as Sencha, or Genmaicha. To take this a step further green teas in general (including many of those from China, Korea, and Vietnam) are superb with seafood. Rice and green tea is also a natural fit. In many traditional Japanese meals the course before dessert is often Ochazuke - rice in a green tea broth often with salmon. Greenish oolongs are best thought of as green teas for pairing. Green oolongs can be made stronger and still remain smoother than any green tea. These teas have more sweetness because of the heavier body of the tea. They go very well with scallops, lobster and other sweet rich seafood, Pouchong Ching Fung and Nantou Oolong are wonderful in this regard. The toastiness of these teas is the most prominent flavor characteristic, except in Oriental Beauty Oolongs (which are purely sweet). 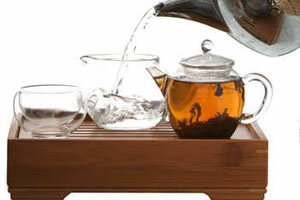 Stronger flavors like grilled foods match well the darker oolongs such as Phoenix Oolong, Tieguanyin, or Crooked Horse. Duck with sweet Oriental Beauty is wonderful. With pronounced tannins and corresponding strong finish, black teas are excellent with very full flavored foods: meats, curries, pastry etc. Black teas range in taste from light Darjeeling to very bold Assam. In between these extremes with a wonderful honey flavor is Royal Yunnan. Since they come from the inland province of Yunnan in China goes well with chicken and meats, stir fry, and anything with lots of animal fat or other oils. Our tuocha (aged for 8 years) is a wonderful way to get to experience Pu-erh teas.